The maize harvest on Milltown Farm in Ballylinan, Co. Laois was completed in the last few weeks by agri-contractors, the Brennans of Crossneen. 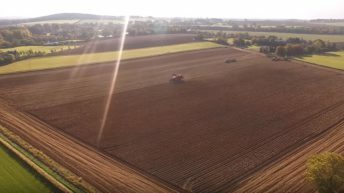 Paul Brennan of Skyfly Photography was on hand with a drone to film the harvest. The maize was cut with a Claas Jaguar and put into a trailer attached to a John Deere. The video shows the maize being cut and two John Deeres with trailers taking the maize away from the field to be compacted in a pit. It’s then brought back to the farm where it’s compacted in the pit by a JCB. The pit is beside cattle housing, which can be seen being fed from another silage pit on the farm. 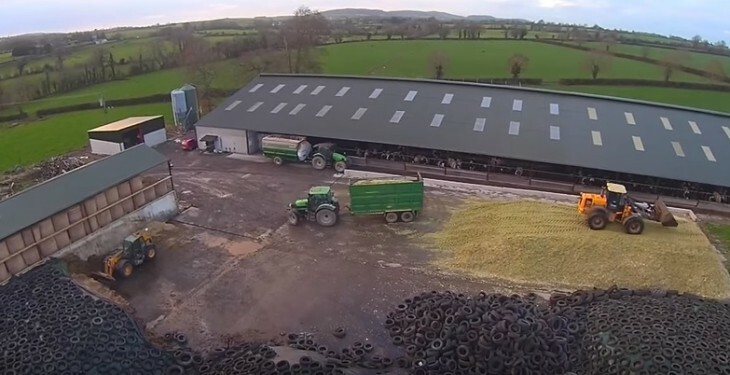 From the looks of the video, there are four pits on the farm, including the pit that the recently cut maize is being put in. We won’t hazard a guess as to how many tyres are holding down the plastic! There’s frost, snow and rain on the way this weekend and temperatures are to drop below freezing in parts, according to Met Eireann. Looking to Saturday, it said that it will be cold, dry and frosty in the north of the country to start. Further south, cloudy damp conditions will deteriorate further and push northwards. Rain will turn heavy and will fall as snow initially, however the snow will clear with the advancing heavy rain. Temperatures on Saturday will rise in the south to 10 or 11 degrees as milder air is drawn up over the country once again by advancing frontal systems, further north will remain cooler for much of the day, it said. According to Met Eireann, the rain will continue overnight on Saturday and there’ll be further outbreaks of rain on Sunday, although many parts will become dry during the day. Temperatures will recover somewhat and Sunday night is unlikely to be frosty, winds will be moderate to fresh south to southeasterly. Looking to next week, Met Eireann has said that Monday will be showery and unsettled, some showers heavy but remaining mild for the time of year. The further outlook is for continued unsettled weather although current indications suggest dry weather for Tuesday and Wednesday at this point, it said. 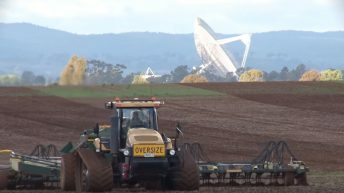 Video: Ever wondered what it’s like to farm in Australia?